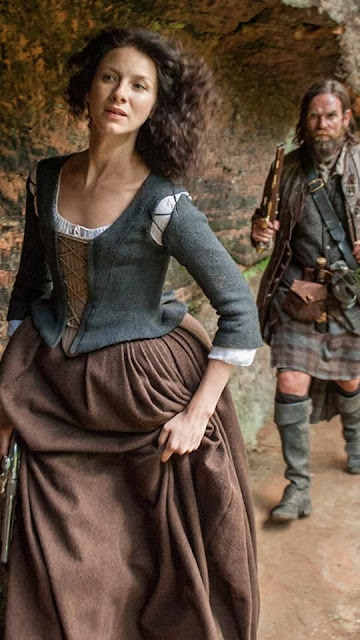 I just started binge-watching Outlander and—though I'm just beginning Season 2—I've been sucked in. The sweeping, scenic views of Scotland. That ginger-haired laddie Jamie. And, of course, the gorgeous costumes. Lately, I can't stop wondering how I could get away with dressing like Claire every single day. I would love to go frolicking about in lavish gowns. And working from home, the most judgement I'd probably face would be a side-eye from my cats—and some level of complaint from G, who'd probably get stuck helping me with all that buttoning and corset-lacing. But realistically, I need a more modern approach. Something that pays homage to the feminine silhouettes of the 18th Century, nods to the tartan and bulky knits of Scotland, and can still be worn to the office, or out to dinner, or antiquing on the weekends. Pulling these outfits together has me longing for crisp fall weather, which has finally arrived in Iowa after days of 90 degrees and humidity. 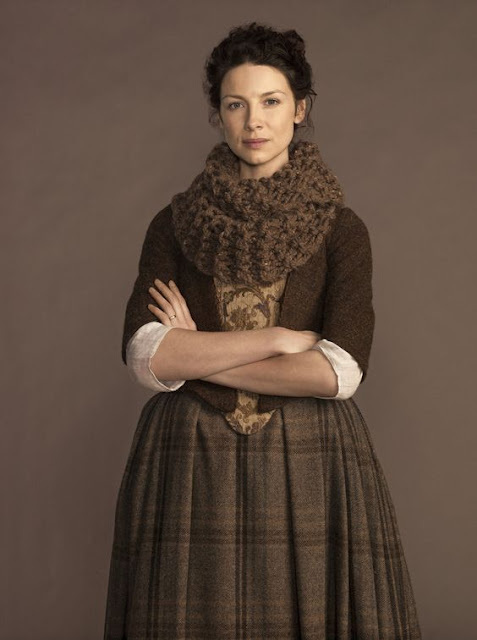 I adore this outfit on Claire because it mixes patterns, textures, and cozy autumnal hues. Who'd have thought that brocade, tartan, wool, and knit would look so good together? 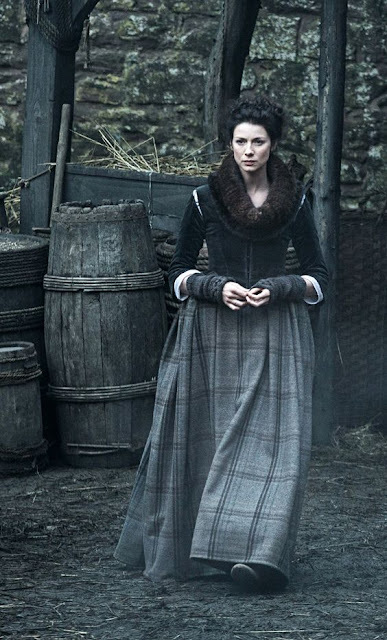 If I had to wear one Outlander-inspired look, this would be it. Shop this set on Polyvore here. 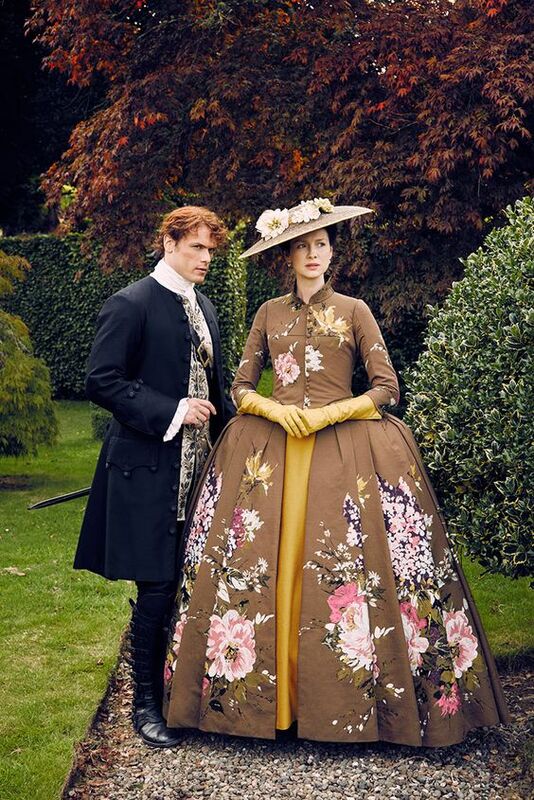 Ah, Claire's wedding dress! Depending on the lighting, it's gray, then it's beige, then green, then greenish greige. In the candlelight, the metallic woven-in threads glitter. I may have gasped when she turned up on the screen in this gown. 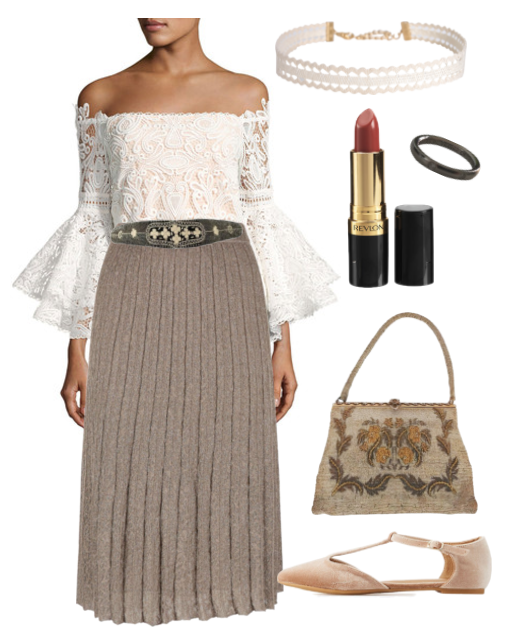 I love the contrast between the structured, pleated wool skirt and the flowy, lacy, feminine bell sleeves. Even though Claire gets to wear a lot of exquisite dresses, her everyday outfits are so inspiring, too—like this casual ensemble with that adorable knit capelet. It's perhaps one of my favorites to recreate. And it's versatile and casual enough to wear almost anywhere this fall. The red dress! 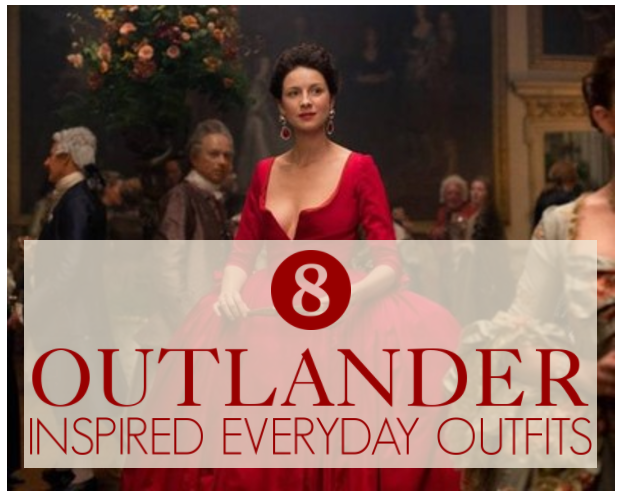 I couldn't possibly do an Outlander-themed fashion post without featuring this crimson beauty. And don't you just love that glimpse of her strappy scarlet shoes?! 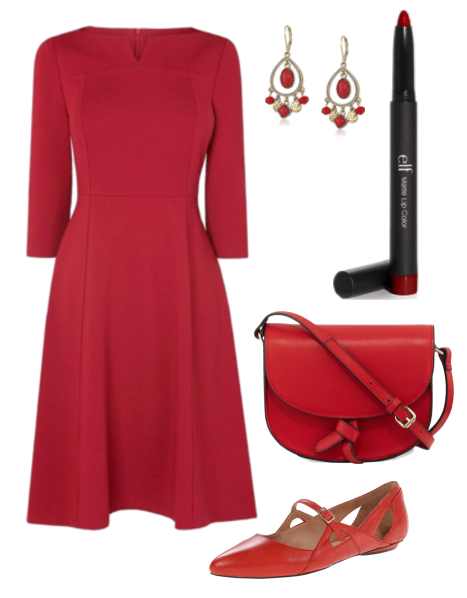 I know that there are fancy red dresses out there for emulating this look, but I wanted to pull together something that I could wear in my daily life—and not have to wait for a wedding or the rare formal occasion. This red dress is perfect. It's form-fitting with a just-flowy-enough skirt. The sleeves fall right at the elbow—just like on Claire's gown. And while the neckline is much more modest (enough so even for the workplace) it also features that little dip that mimics the real deal. This outfit makes me kinda-sorta-almost look forward to winter in all its gray gloominess. Claire just looks so warm and cozy with that fur scarf and knit wrist warmers. Another simple everyday look of Claire's that I love is this brown skirt/blue top combination. I'd recreate it with an office environment in mind. 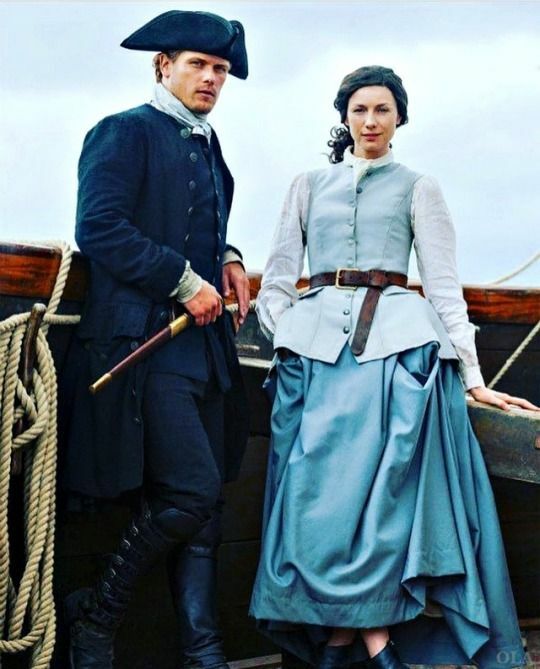 I haven't gotten to this episode yet, but I'm smitten with the sky blue skirt and pale, bluish seafoam vest/waistcoat Claire is wearing here. (Jamie looks pretty dapper in that getup and tricorn hat, too.) I'm not much of a vest person myself, so I recreated this look with a short-sleeved cardigan. How lovely is this gown?! Modernizing this outfit was really all about the colors, floral pattern, and silhouette. I did add a smidgen more of the hot pink, because I can't resist how it pairs with brown and mustard yellow. So tell me: Do you watch Outlander? Which outfit is your favorite? 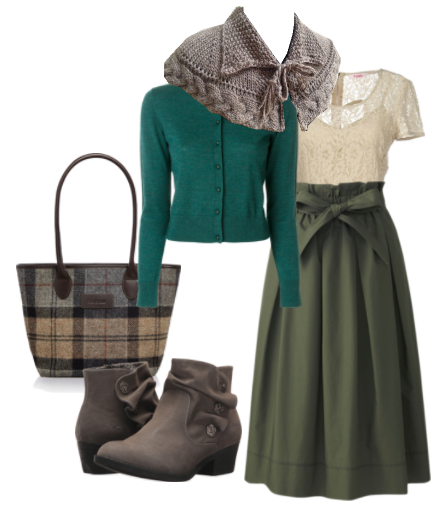 Will you be incorporating chunky knits, tartan, or other Outlander styles into your wardrobe this fall? I'd love the links to the items or the polyvore layouts because some of these pieces are amazing, especially that magenta blouse in the last outfit.